Our families obsession with seeing the Rolling Stones live has emerged again . 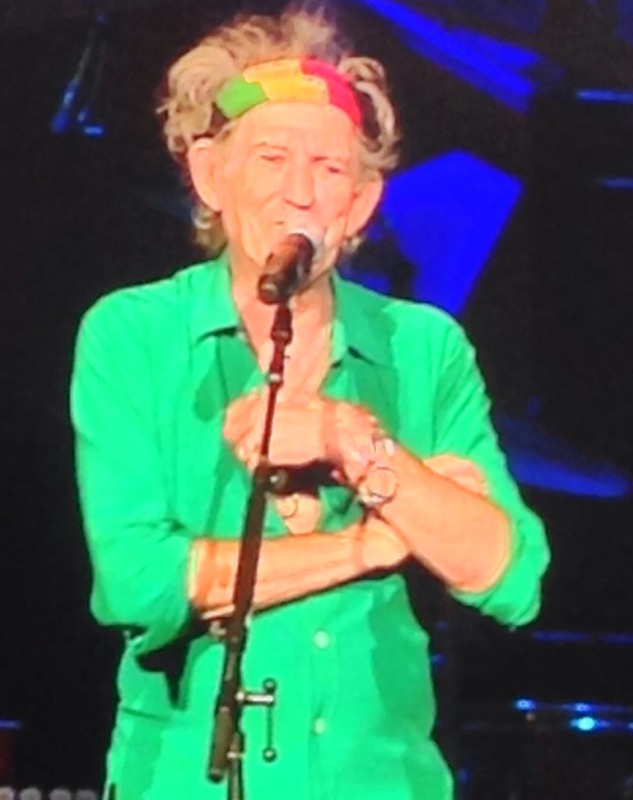 They are currently finishing their Australasian tour and so I get the chance to review Keith’s choice of headband. Scrutiny of his headwear on this tour made me realise he also has the perfect ears to wear a pair of CI’s. But the time has come when the headband is no longer mandatory . Harry’s recent addition of glasses has meant there is just too much headgear for a little kid. When you factor in hats and bike helmets poor Harry is so top-heavy he couldn’t balance even if his vestibular system was functioning well. On a few of our over 30 degree Spring days it became obvious that the headband was not working well with the glasses. Sweating like a gypsy with a mortgage, all fogged up so he couldn’t see , there was just too much gear to manage. Also the weight of the battery and processor over the top of his ears and the glasses arm together were almost bending his ear in half- And I had been so proud of his flat ears – secretly I had loved the fact that the headband held his ears back and stopped them from curling! The glasses have a plastic frame with no screws so that they do not break when placed in contact with the pavement at high speed- ie the face plant . At the back they are held in place with an adjustable elastic band so as to ensure stability and to stay in place at all times. The glasses are made by a company called Mira Flex. Demo Video here. I am so pleased with this choice of glasses as the elastic also serves to hold the CI cable in place so if the magnet drops off the processors are left dangling under the glasses elastic. Harry has taken to wearing them like a duck to water, which is ironic as we spent 6 months delaying getting them as thought it would all be too much for him ( and us). Without a doubt they are really helping and it is mainly for long distance and astigmatism. An astigmatism ” usually occurs when the front surface of the eye, the cornea, has an irregular curvature. Astigmatism is one of a group of eye conditions known as refractive errors and is very common. Refractive errors cause a disturbance in the way that light rays are focused within the eye. Astigmatism often occurs with nearsightedness and farsightedness, conditions also resulting from refractive errors. Astigmatism is not a disease nor does it mean that you have “bad eyes.” It simply means that you have a variation or disturbance in the shape of your cornea”. Apparently 1 in 3 children ( not just deaf children) will have to use glasses at some point in their childhood. 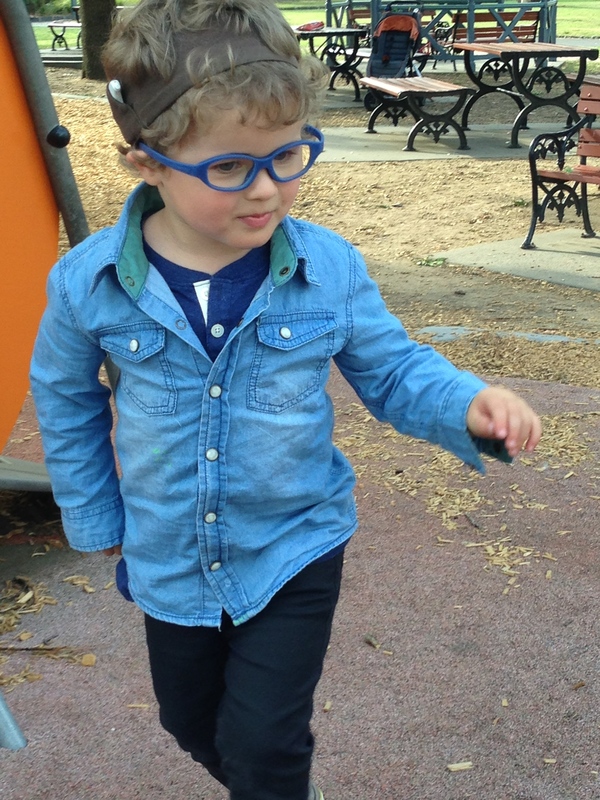 With a deaf child you are looped into seeing a Ophthamologist at a very stage. The reason for this is that there are some extremely rare diseases out there that link the eyes and the ears. An Opthamologist can ensure that they are monitoring the health of your childs eyes as they grow and will look out for any signs of alteration in the retina. So if you are the parent of a profoundly deaf child and haven’t yet been to see an ophthalmologist, please consider it. To look for one start with your local Children’s Hospital as they will have more experience with profoundly deaf children and their needs. 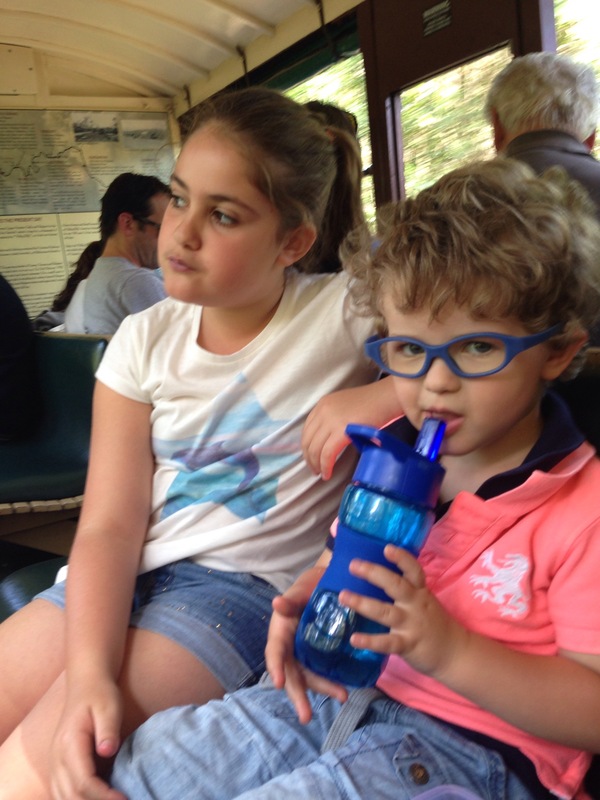 I am only labouring this as the glasses have had a huge impact on Harry’s general ability to compensate all round. The most obvious change since Harry started wearing the glasses is his balance. He seems to be so much more in control of his movement and the teachers at his kinder have seen a marked improvement in his eye contact when being spoken to and speaking to others. This is a funny one, as a lack of eye contact can often be interpreted as a sign of Autism. I have said it before , and this is my non medical opinion only, but it is not always the case- I am sure with Harry it was just about the fact he had so much information to process and his eyes were working so hard to help him balance and compensate for the reduced hearing capacity , that they were too busy to look at people directly when spoken to. So now we have a son who is almost too cool for school. 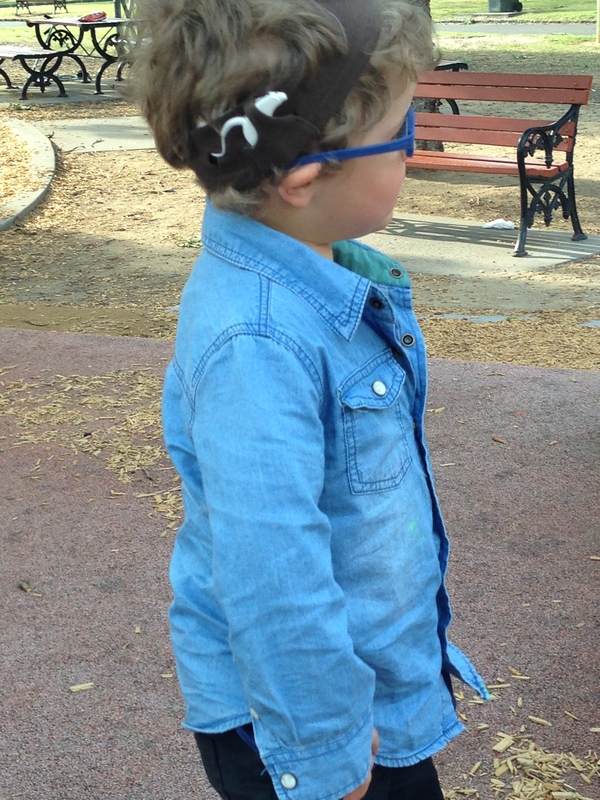 His mates at kinder have returned home requesting to have glasses like Harry and with the removal of the headband he somehow seems more grown up. In 3 weeks time he will graduate from The Toddler Room at school ready to embark on 3yr old Kinder in 2015 . A proper classroom with 22 kids and only 2 teachers which will be a huge step from the 10 kids and 4 teachers he has had for the last 2 years. He is so ready and I am so nervous. There are so many things to consider and prepare for. The use of the FM microphone will be so crucial to ensure he gets access to all the speech from the teachers. But what about hearing what the other kids say…….I can’t even imagine how he will manage to pull out the words of his peers from the clutter of noise that 22 children will create in one room and manage to know what they want to play with him . There is no doubt he will manage it and use strategies we can’t even comprehend to ensure he doesn’t miss out. He will commit the routines in the room to memory as fast as Clark Kent changes to Superman in a phone box . But for now it is nearly Summer and he can look forward to enjoying being free on the beach.